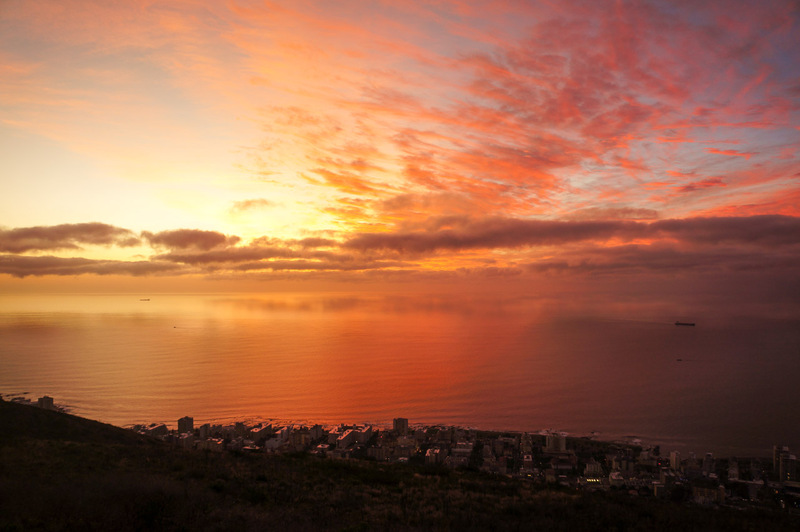 Cape Town, the heart of South Africa. 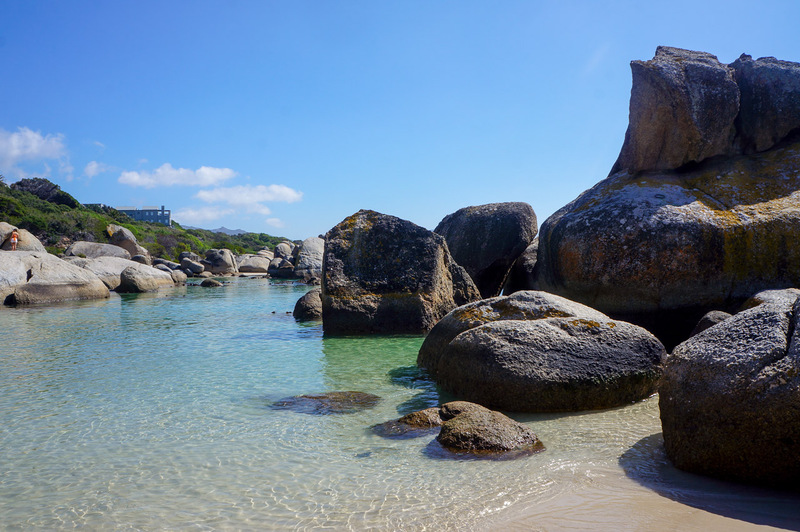 I’m yet to hear someone say they haven’t enjoyed their time in Cape Town. What is there not to love?! 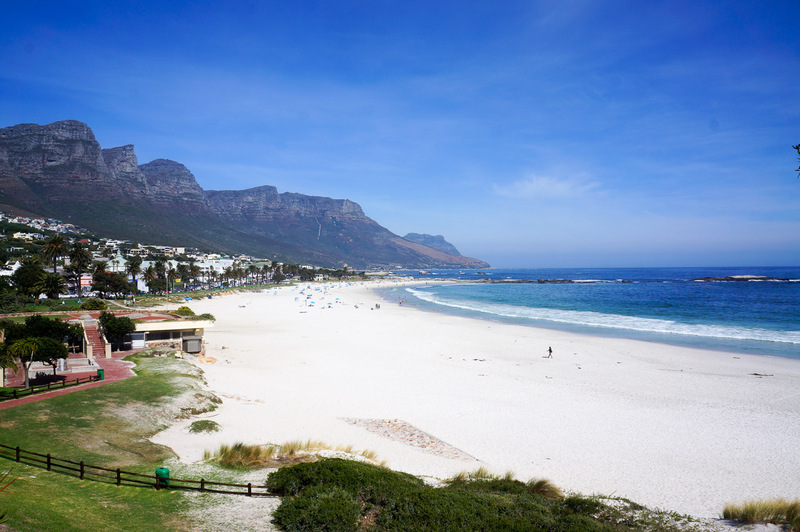 Cape Town has fallen into spot #2 for our favourite city… it would be #1 if the water wasn’t so darn cold at the beaches! 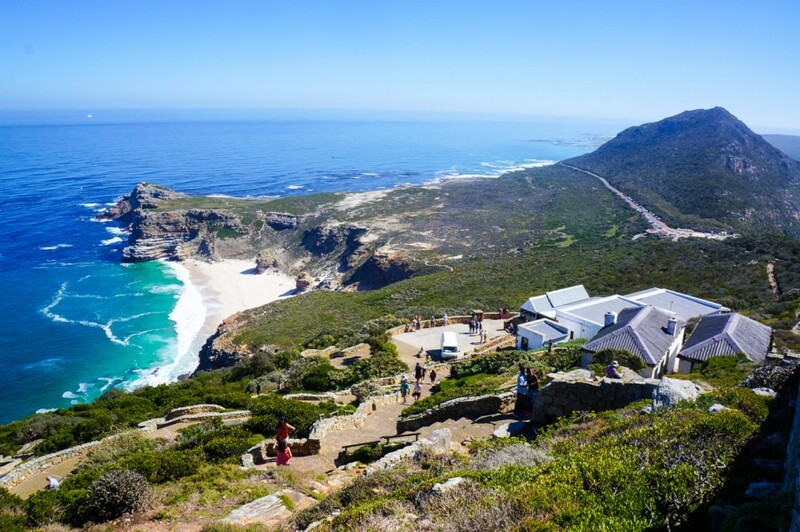 Cape Town is known for its gastronomy with some of the top restaurants and chefs in the world, friendly people, breathtaking scenery, scenic drives and unfortunately, the conflicted history. 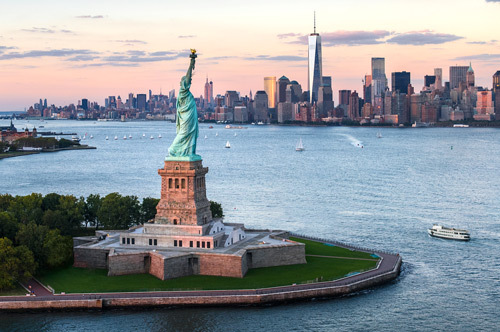 It’s definitely high on the list as one of the most affordable cities we’ve visited on our travels so far and the first city in a long while that Jacob and I have been ordering our own meals at every sitting – a real treat when you’re usually fighting over a shared meal. 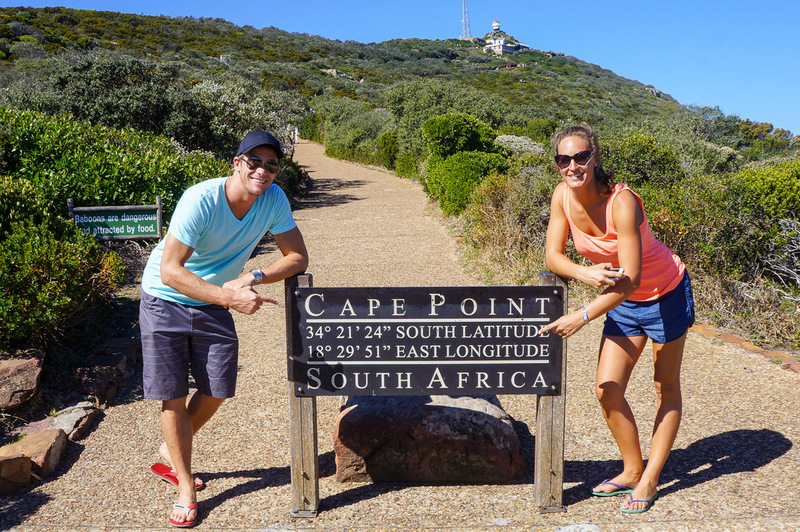 How long do you need to Cape Town? Forrrrrreeeeeeever. No, well, there really is no maximum amount of time you can spend in CT. 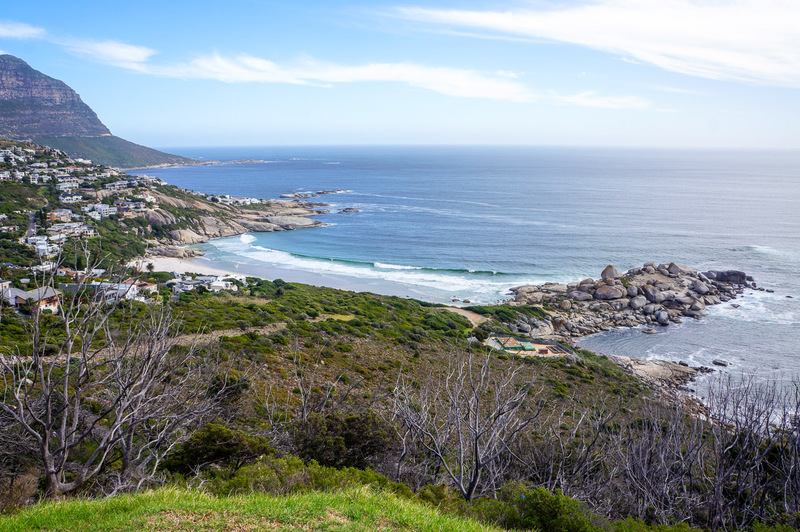 The city, plus it’s surrounding towns, beaches and drives are simply beautiful. We spent 8 days total but spread those days over the city and out of town trips (included below). We wouldn’t recommend any less than 5 days. 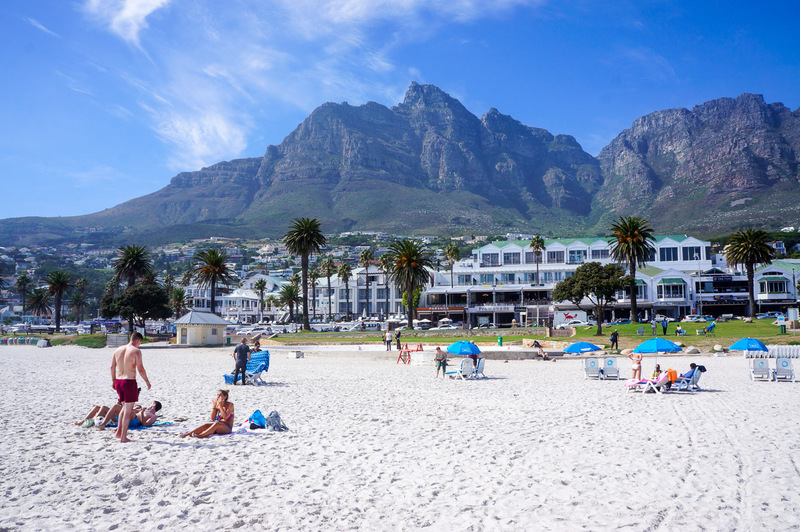 There is no shortage of hotels, hostels or apartment rentals in Cape Town and they range from inexpensive to luxury. Choose your base depending on your priorities. Staying close to the city centre allows easy access to many of Cape Towns restaurants and bars along with the transport system but it is further from the beach and some of the major sites. 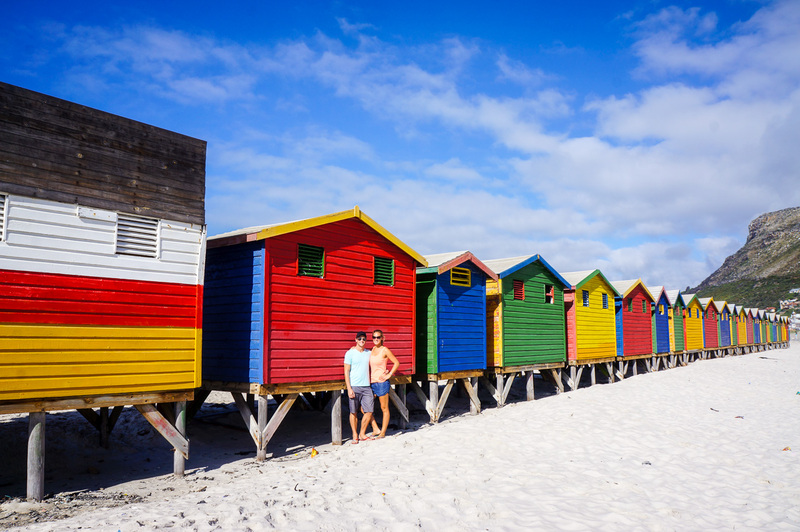 Beach-side locations are generally more expensive, areas such as Seapoint and Greenpoint but they have the beach at your step. 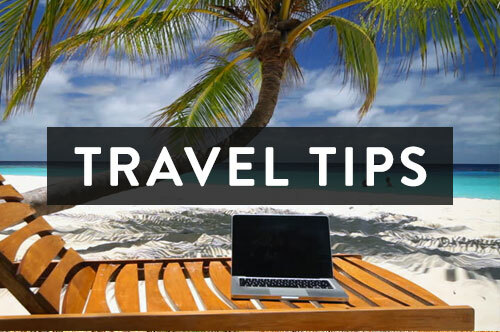 Regardless of where you stay, everything is very accessible via Uber or car rental. View hotels in Cape Town. 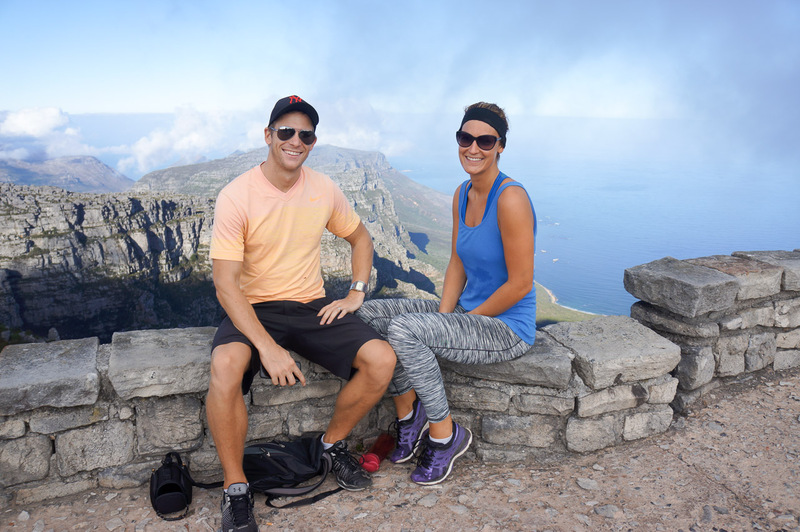 Fortunately, we had very good family friends in Cape Town and spent our time at their place in Rondebosch. 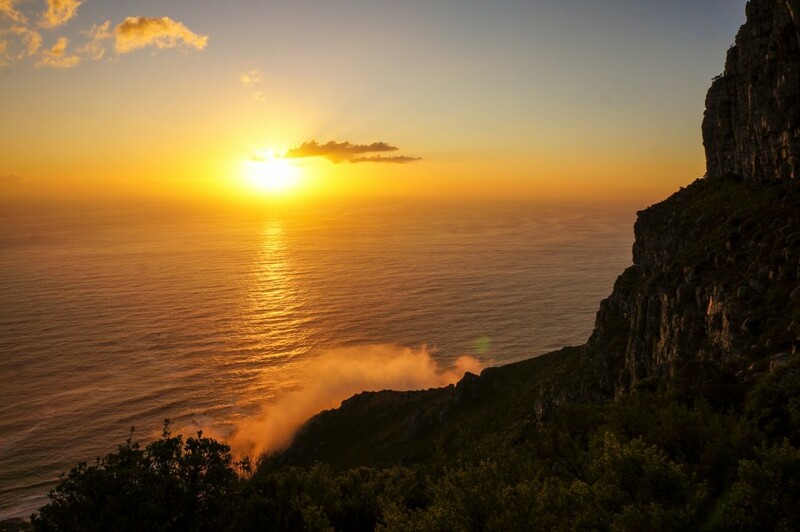 Table Mountain is the most visited attraction in Cape Town and rightfully so. 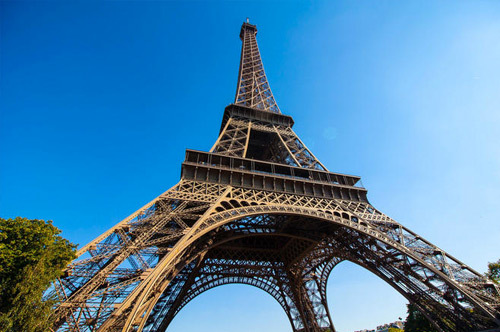 It is a large flat-topped mountain overlooking the entire city. 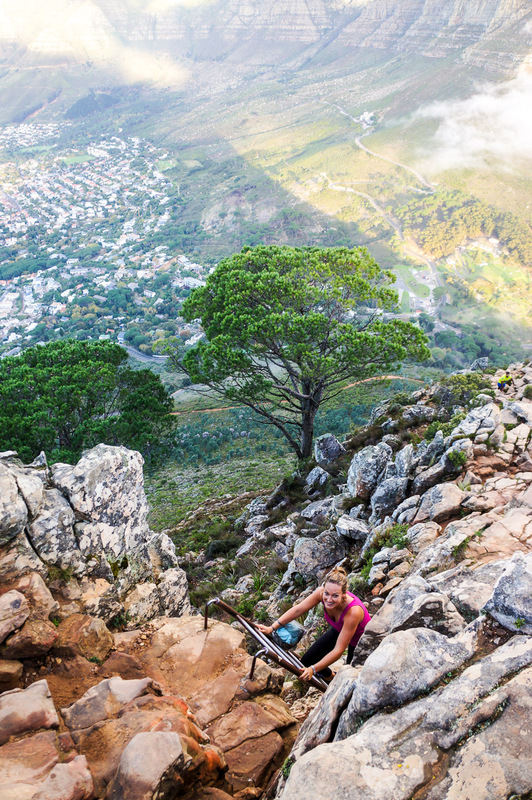 You can reach the top via cable car or by hiking. The first cable car up is at 8:30 am and the last down at 5:30 pm. One way will cost 125 ZAR & round trip 240 ZAR. 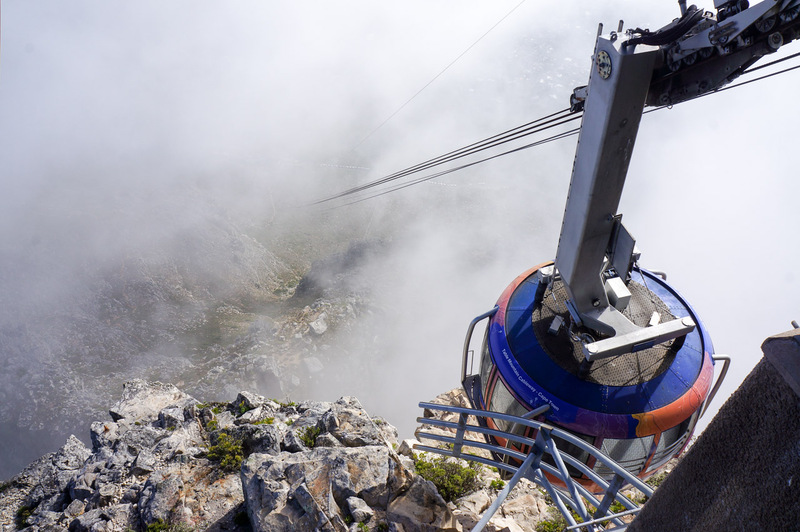 We recommend hiking up to the top and taking the cable car down. The walk is half the fun! 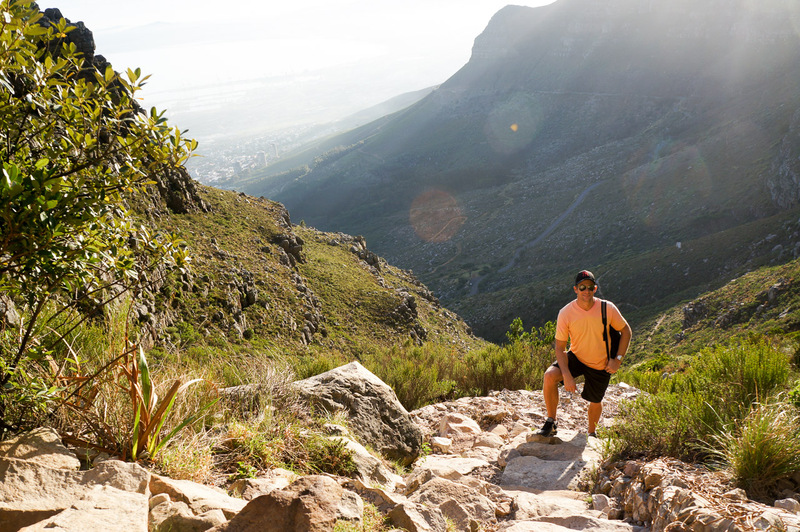 Be sure to take the correct path because if you don’t you could be stuck on a much longer, tougher hike to the top. 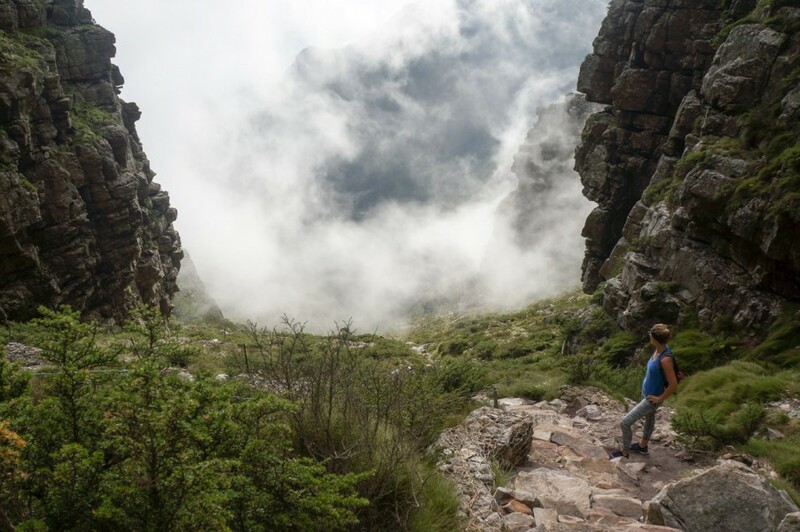 The Platteklip Gorge hike is the steepest but the most direct, it will take 1/1.5 hours to reach the top. 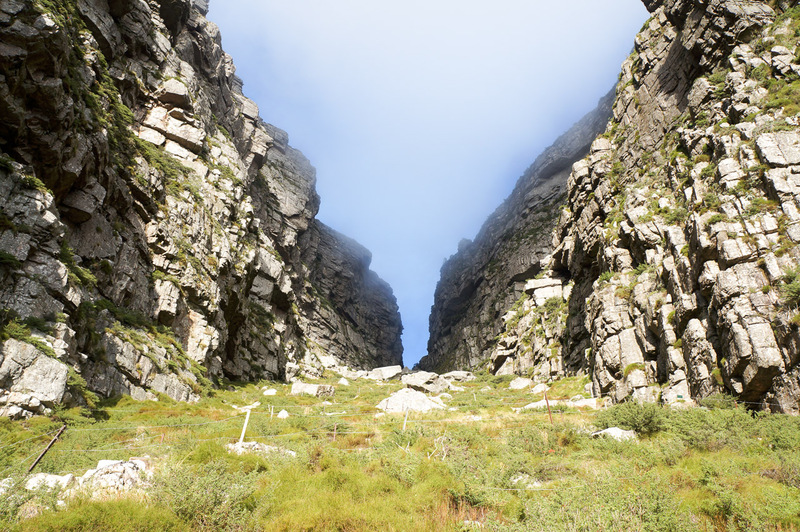 The entrance is located 2 km past the cable car station on the right-hand side. 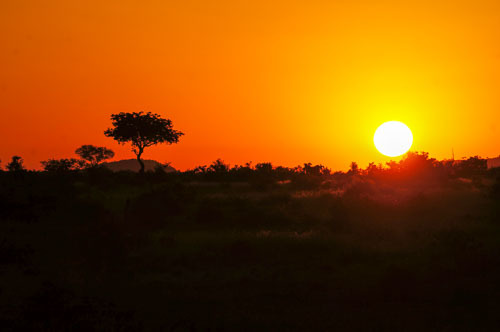 Catch the sunrise and head out early, it’s absolutely stunning! We wouldn’t recommend it any other way. Lions Head is another very popular mountain to hike up with 360 views of Cape Town and of course, it’s neighbouring mountain – Table Mountain. 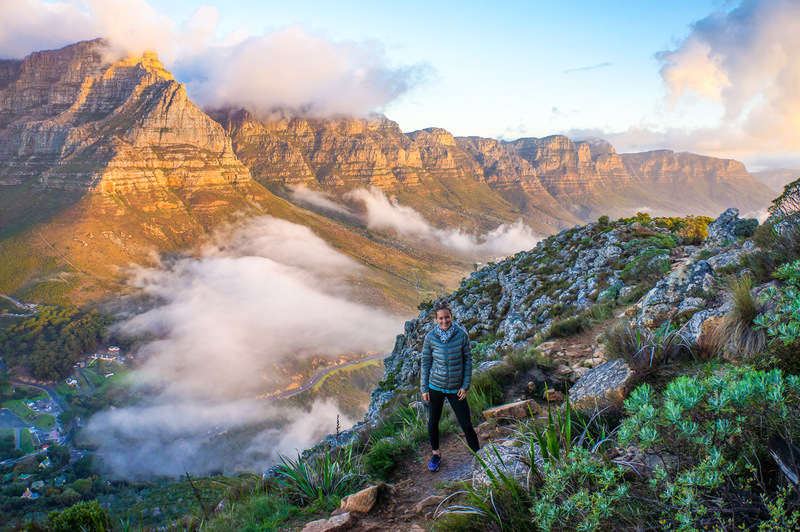 Lions Head is smaller than Table Mountain and you can reach the top with a much easier hike in about 1 hour or so. It is still quite steep at times and you’ll be navigating your way up and around rocks, but don’t give up until you reach the top! 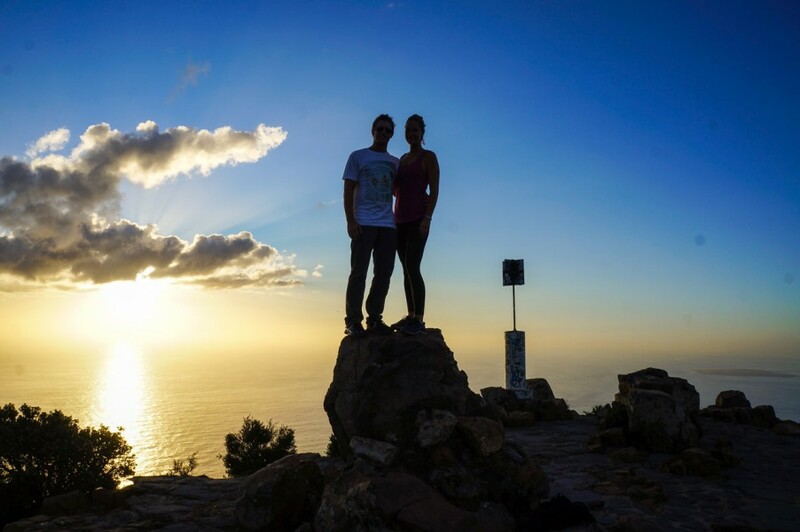 Climbing this mountain is very popular for sunset but be careful not to walk down in the dark, it can get quite dangerous. 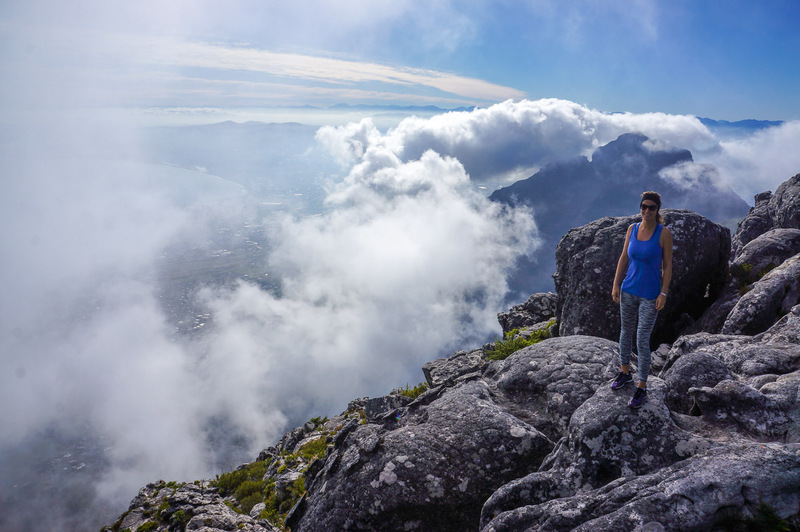 We actually preferred this hike to Table Mountain, purely for the 360 views. 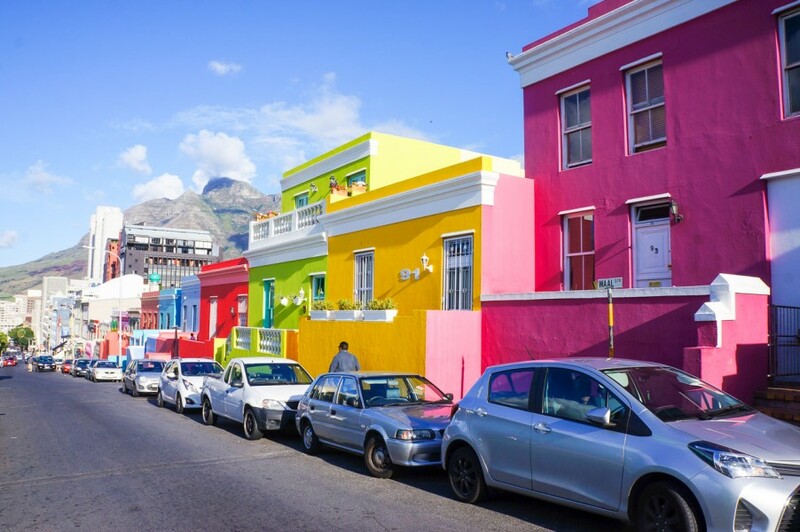 Bo Kaap is known for its cobblestone streets and brightly coloured houses, some dating back to the 1750’s. 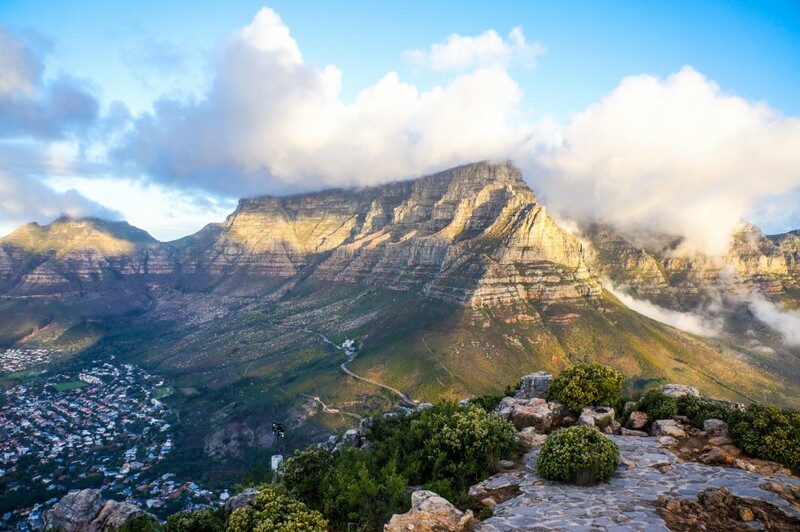 This area, a short walk from Cape Town’s city centre, is known as the Malay Quarter. Many of the slaves imported from the Dutch were from Africa, India, Sri Lanka, Malaysia and the Indonesian islands. 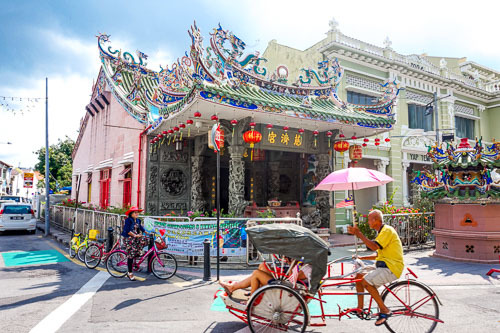 Although still known as the Malay Quarter, more than 90% of the population is now Muslim. Malay Cuisine is very popular in this area and can be found at many traditional restaurants located throughout. 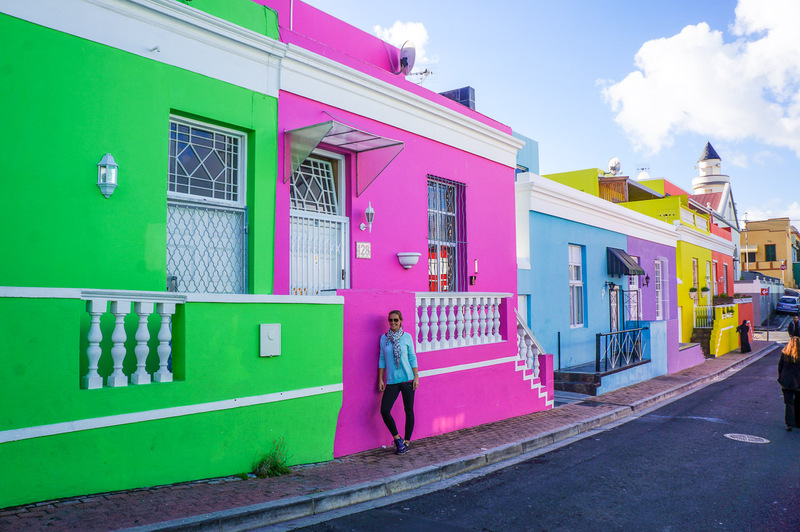 Apart from admiring the colourful houses, take a look in the Bo-Kaap museum and see the lifestyle of a typical 19th-century Muslim family. 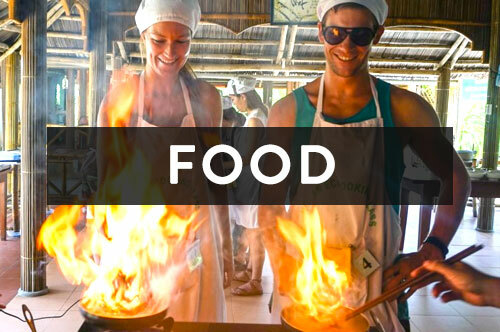 If you love cooking, take a cooking class with Zainie for 700 ZAR. Unfortunately, due to an emergency on her behalf, we weren’t able to do our class but we hope someone else can enjoy what she has to offer, it involves food so it must be good. 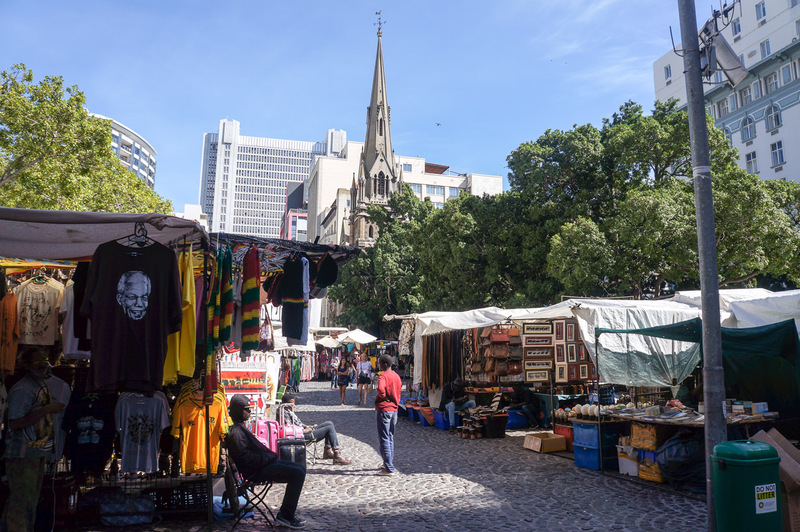 Greenmarket Square is in the heart of Cape Town’s city centre. For quite a small square, it has a big reputation. Many political protests have taken place here, it has been a slave market, a fruit and vegetable market and, during the 1950’s, a parking lot. 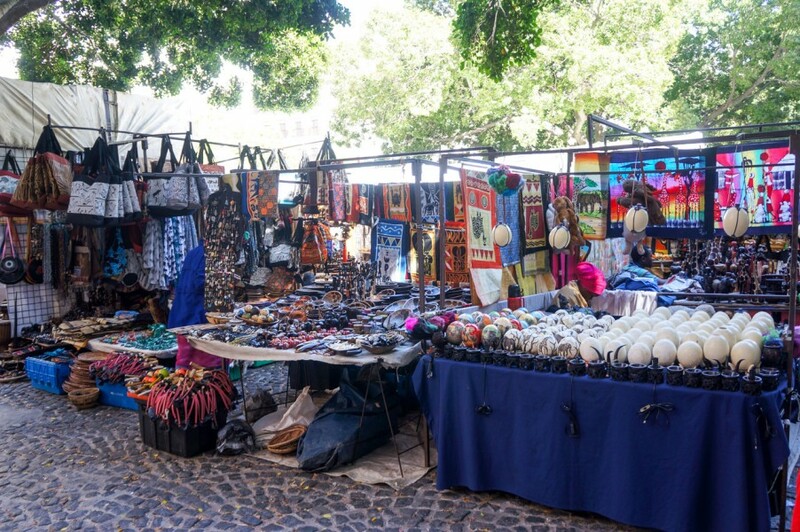 Today, it is purely a flea market selling souvenirs’, sunglasses, music, artworks, wooden sculptures and clothing. On the weekends especially, you’ll have lots of people roaming around, and the odd entertainer. There are many places to sit and enjoy lunch or a coffee around the square. 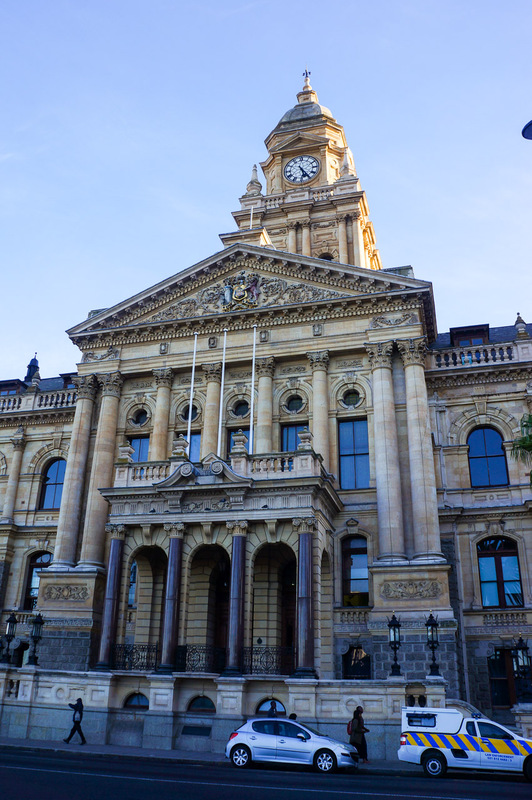 The city centre isn’t very big so it is easily walkable on your own however we took 2 walking tours purely to learn about the history of the city including the devastating facts of the apartheid and Nelson Mandela’s influence on South Africa. 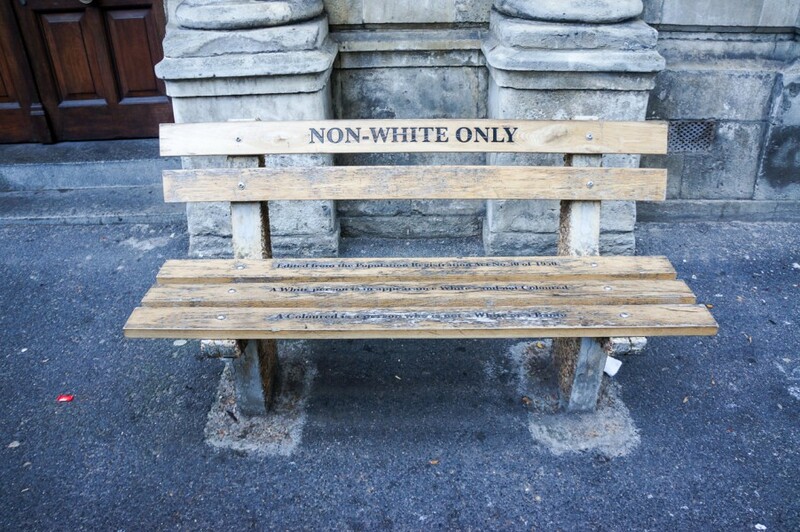 They offer 2 tours, a historic tour and District Six tour. 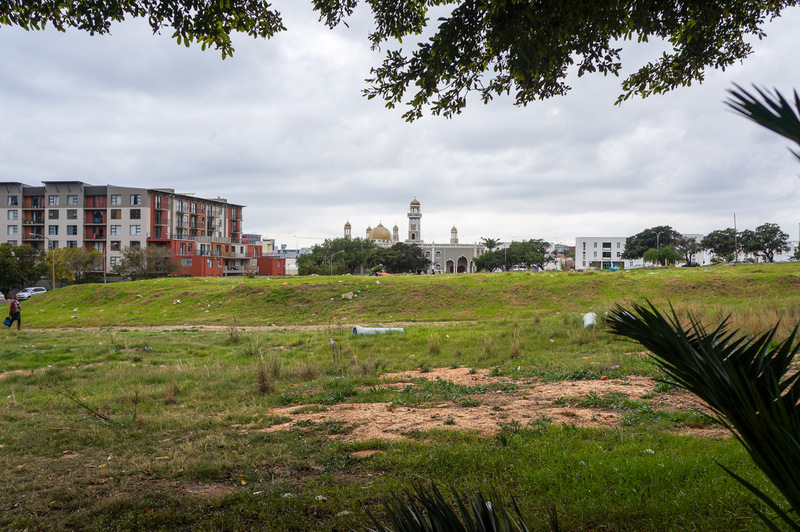 The District six tour will take you through the area where the 60,000 people were removed from their homes in the late 1960’s. 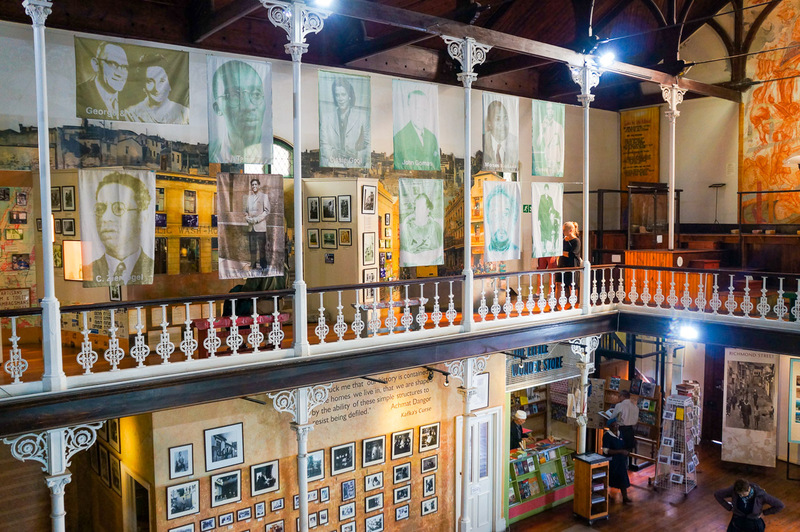 For a thorough understanding of the District Six area, visit the museum (shown above). These tours are much shorter than your regular walking tour (only 1/1.5 hours) but we found them both very informative and insightful. 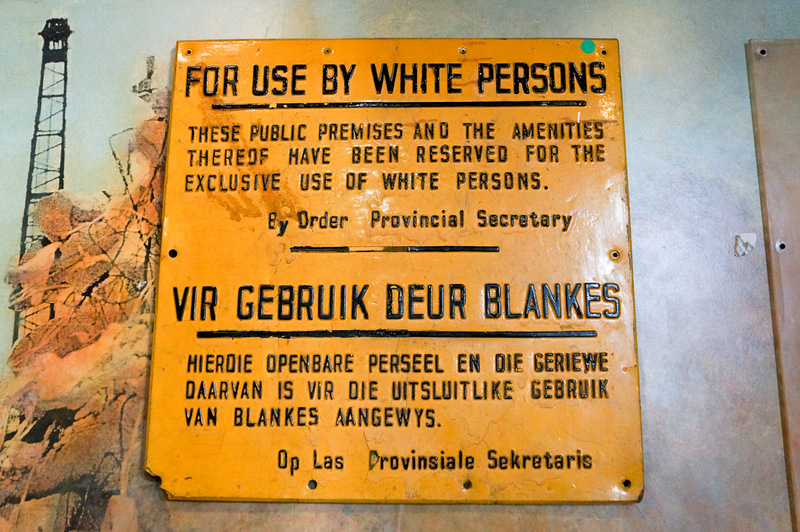 Definitely worth it if you are interested in the history of Cape Town. 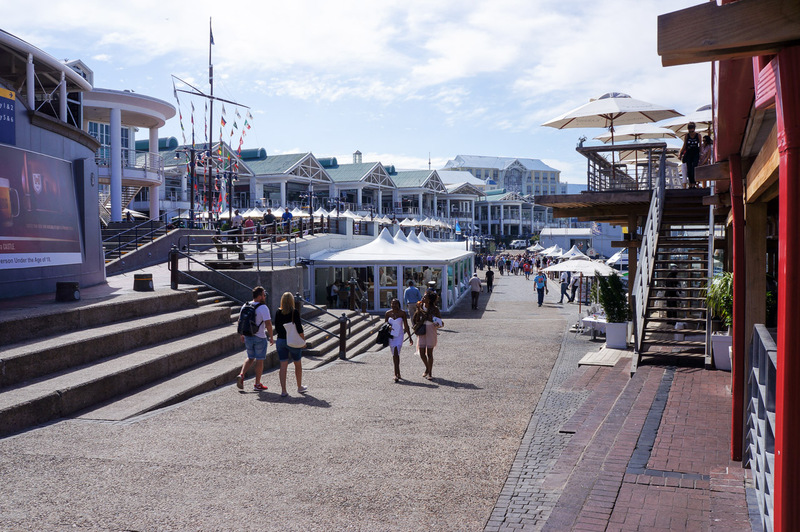 A bustling shopping, dining and entertainment area located right along the waterfront. 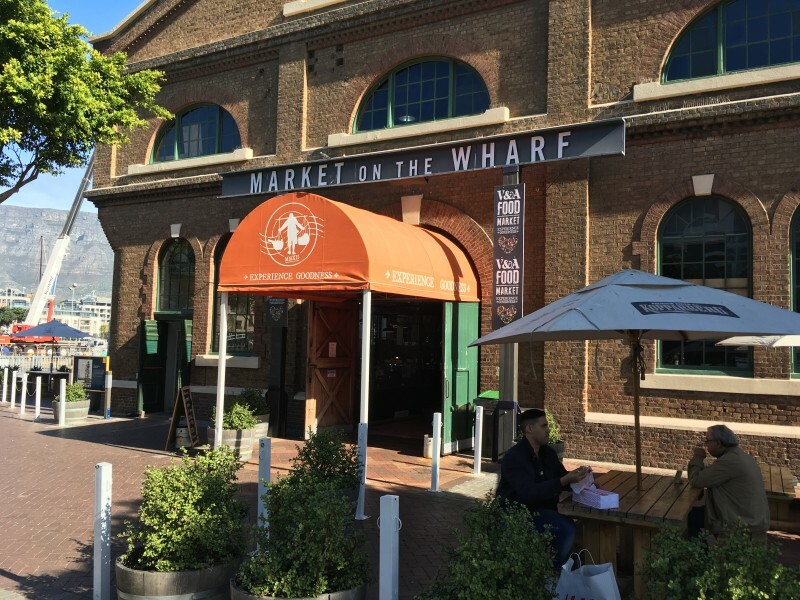 The waterfront was developed from redundant docklands and is now visited by many tourists as well as locals. It reminded us a lot of Circular Quay in Sydney. They also have an outdoor amphitheatre with music, dance and theatre throughout the year. You can also each Robben Island by ferry from the waterfront. If you love burgers and milkshakes, stop in at a Gibson’s Burgers but be prepared for the 52 milkshake flavours you have to choose from! We went all out and ordered a cinnamon doughnut flavour. Apart from the aggressive sugar intake and the fact it was basically a doughnut through a straw… it was delish. 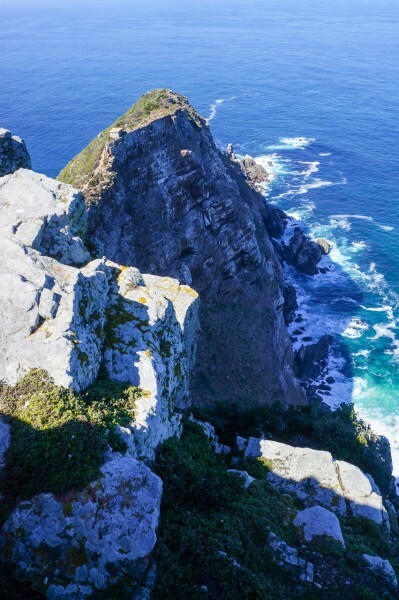 Another one of our favourites and a must visit! 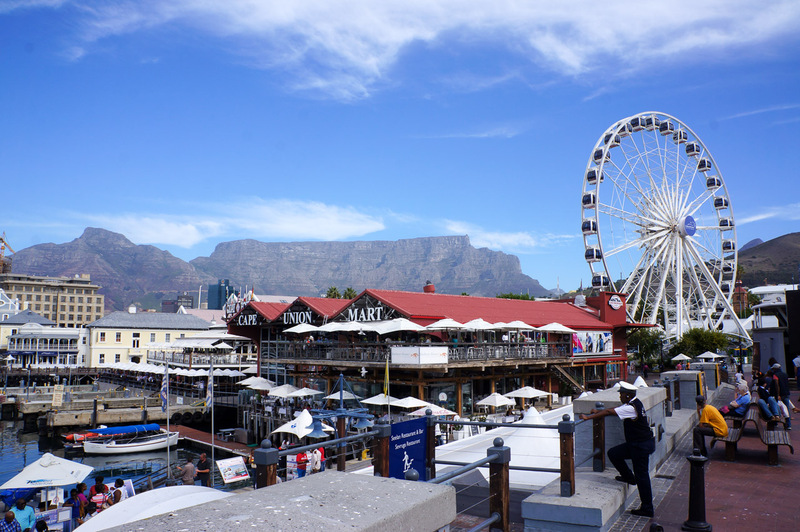 The Eat Food Markets are just outside the waterfront. Open every day, they have a wide selection of delicious food choices to choose from and a few bars to grab a drink, often with live music. Woodstock was once a very dangerous area that no one dared to go but over the last 10 years, it has changed immensely and is now the creative heart of the city. 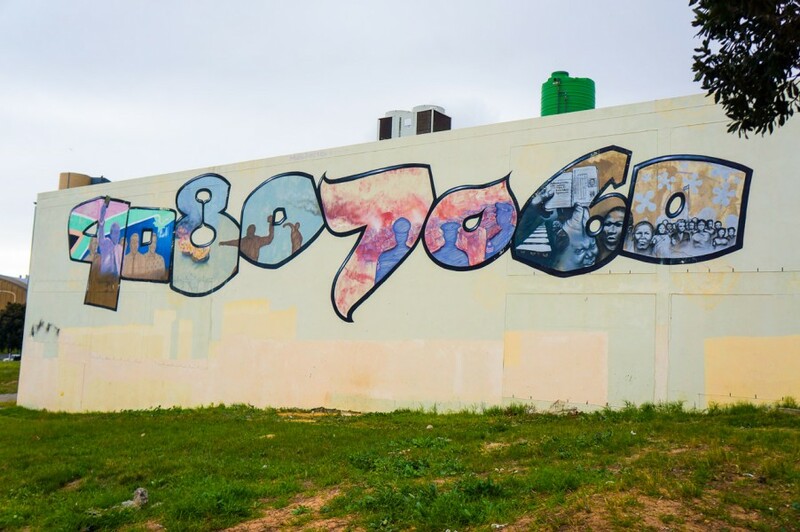 This suburb is filled with galleries, studios, street art and a whole lot of hipsters. Woodstock’s most popular hangout is the ‘The Woodstock Exchange’. Set inside an urban space, it is home to many restaurants, coffee shops, social spaces, work areas, outdoor patios and funky shops. It is real business incubator aimed at all types of designers, photographers, film directors and illustrators. This place encourages creativity and collaboration among young startups and entrepreneurs and is definitely an up and coming area. 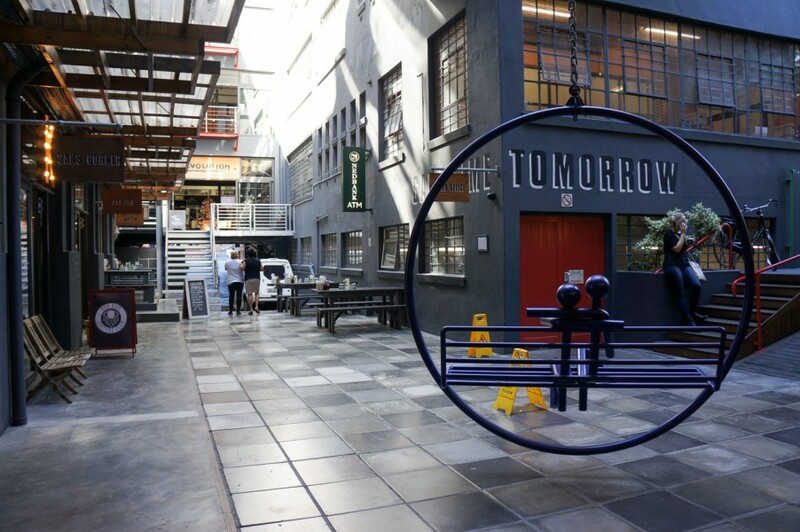 The Old Biscuit Mill is located a short walk from The Woodstock Exchange. 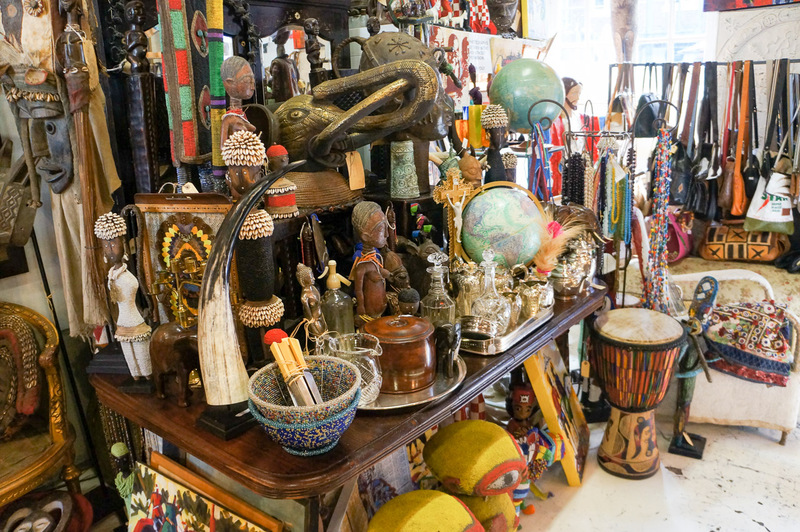 You’ll find authentic African stores, designer shops, a jewellery shop, restaurants and workspaces. 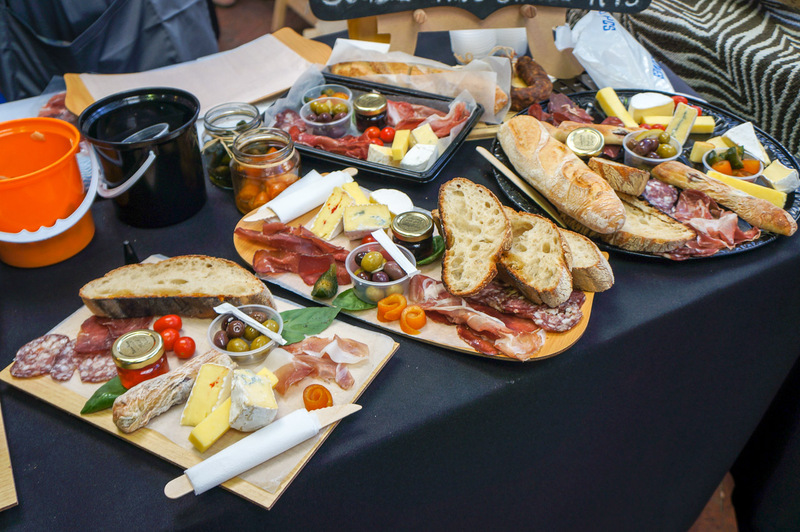 The highlight of the Mill is on Saturdays when it comes alive with over 100 food stalls, live music, markets and a very relaxed atmosphere. 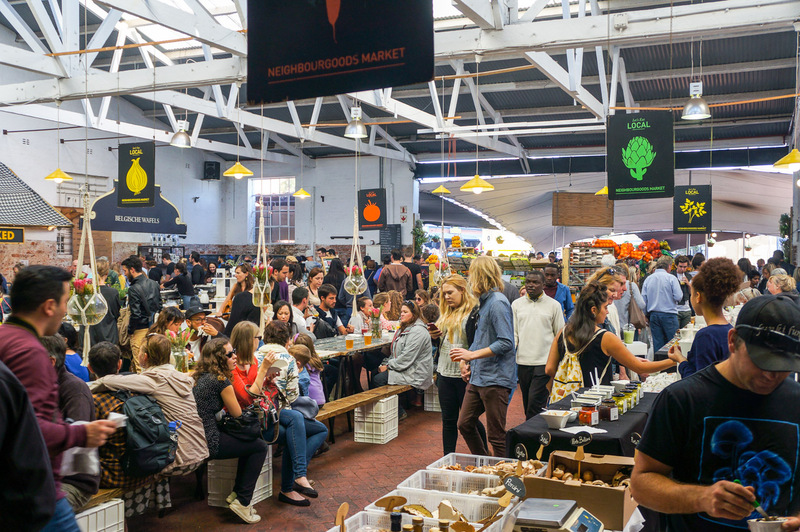 The markets are open from 9 am -2 pm. The only downside of this place? The array of choices of food!! I think we sampled and ate at 8 different stalls, there was no way we could choose just 1 so make sure you come hungry! 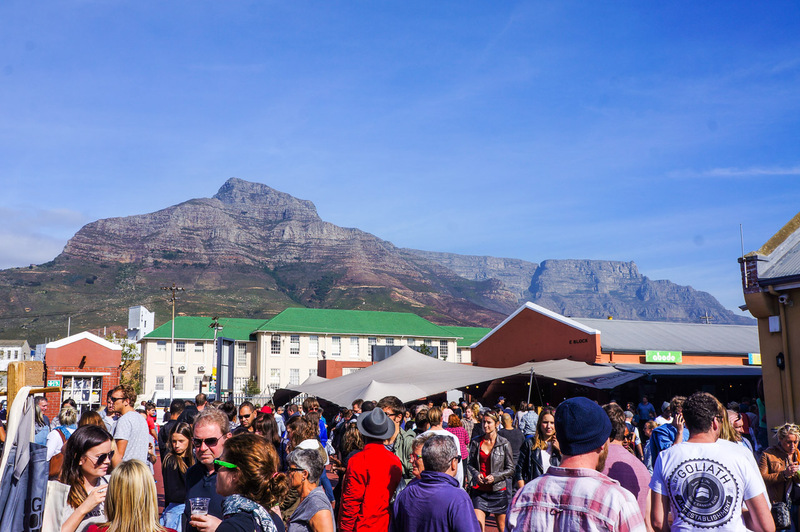 Even without the Saturday markers, the Old Biscuit Mill is worth the visit. 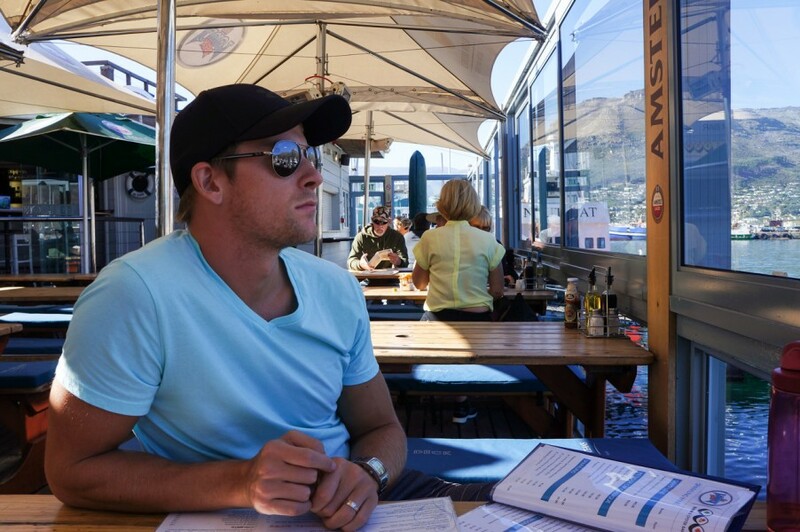 First things first, there is NO shortage of amazing restaurants/bars in Cape Town. 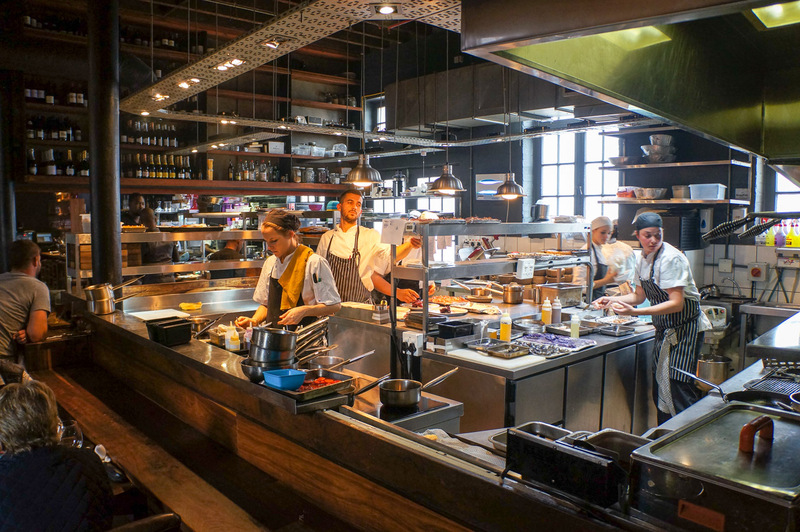 Each restaurant has something unique about it and the service, cost and deliciousness make Cape Town our favourite place to eat so far. 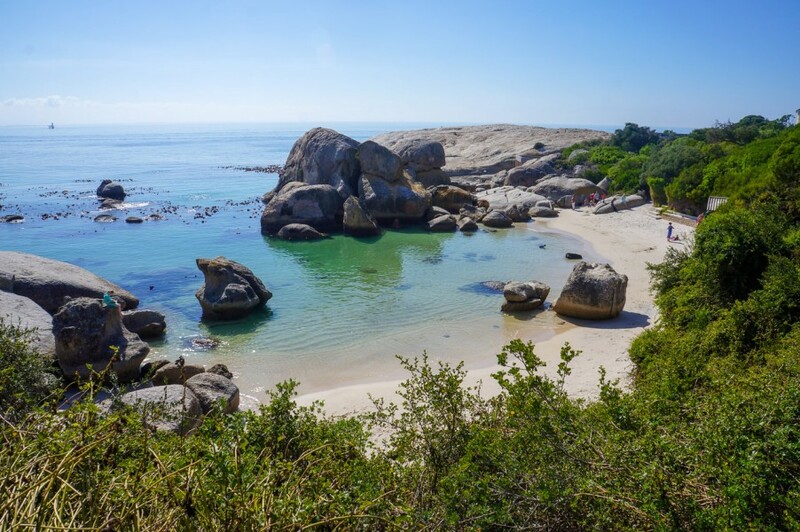 Below is a list of the 3 most commonly visited spots in CT along with our top picks in the area. 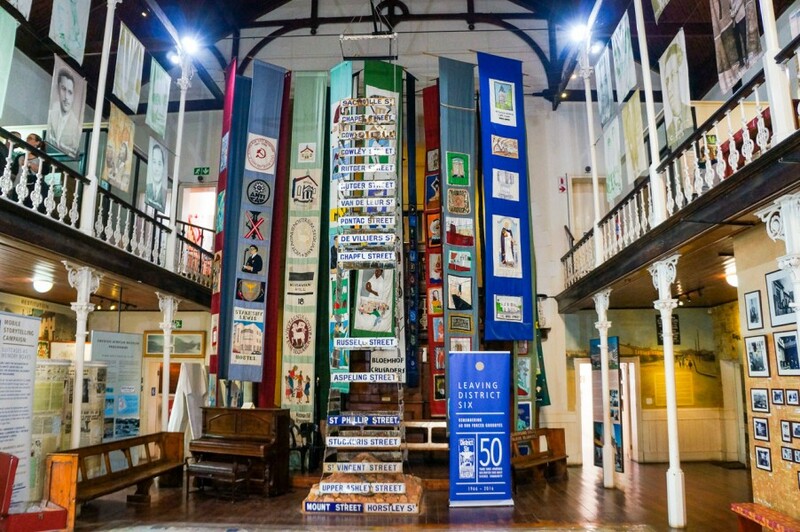 Long Street – Long Street is Cape Town’s most iconic street. It’s a party street with a buzzing energy. It has a range of bars, rooftops and clubs. 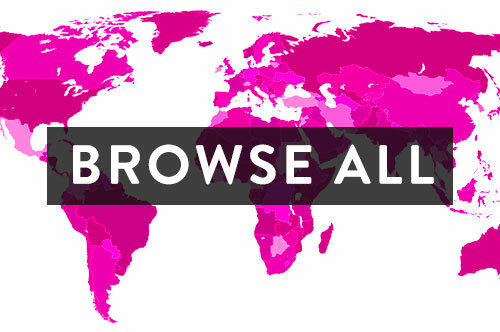 There is a variety of nightlife options for everyone. 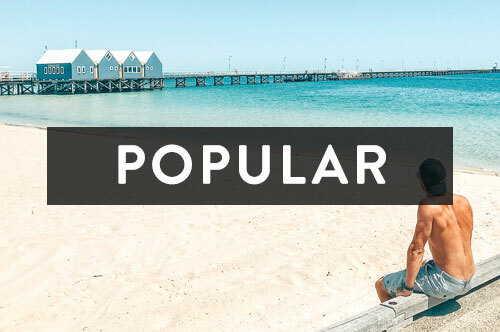 Weekends will bring locals and tourists and eventually, rowdy crowds. Many hostels and ethnic restaurants are also along here. 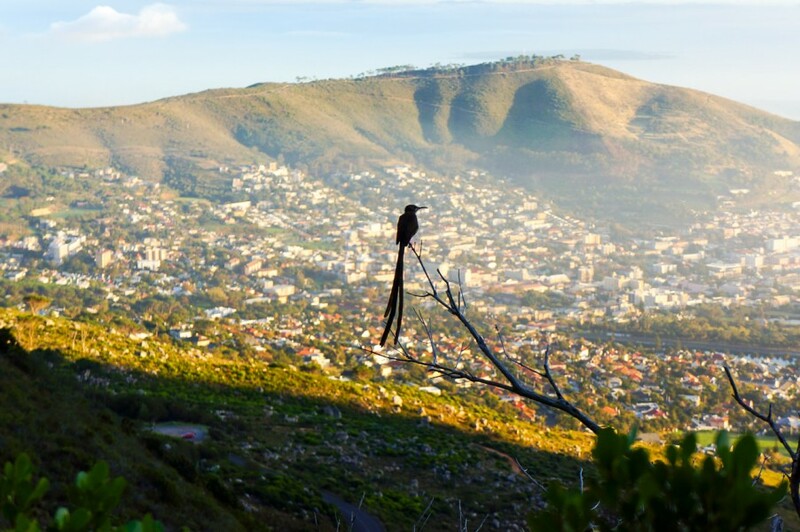 Kloof Street– A slightly more upmarket street with fantastic restaurants, fun shops, art galleries and bars. 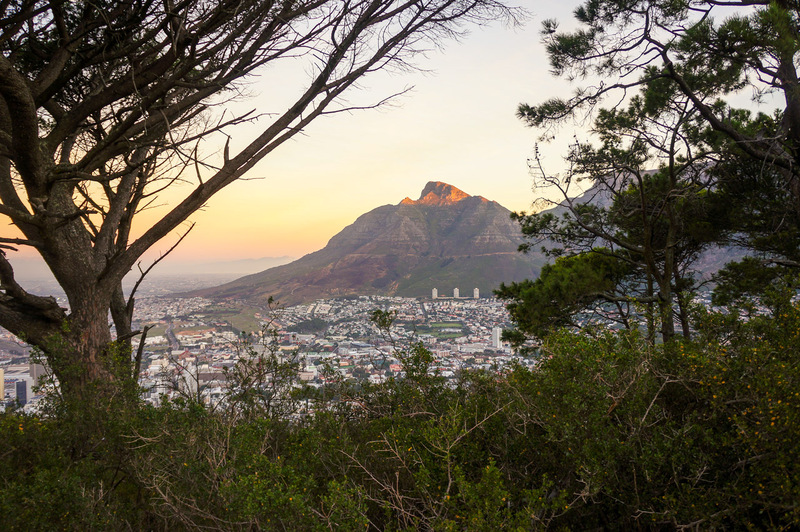 It is located a little out of the city centre, therefore there is a stronger “local” vibe on Kloof Street. 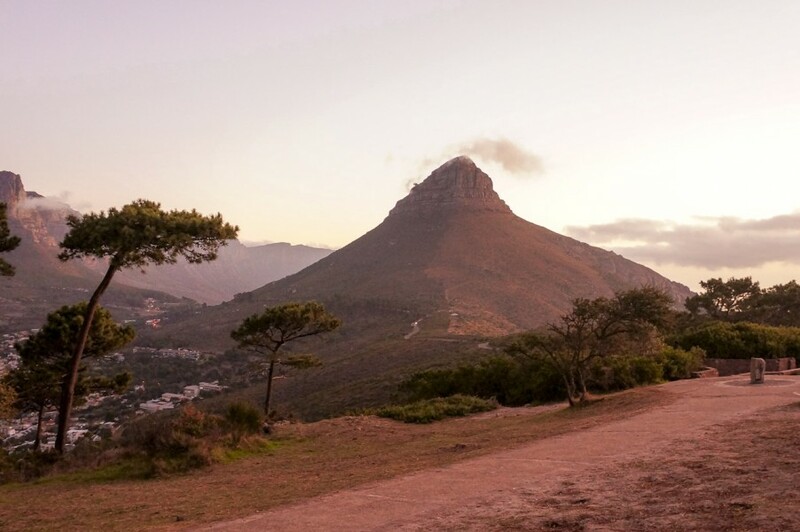 Take a stroll up Kloof and feel like a real Capetonian. 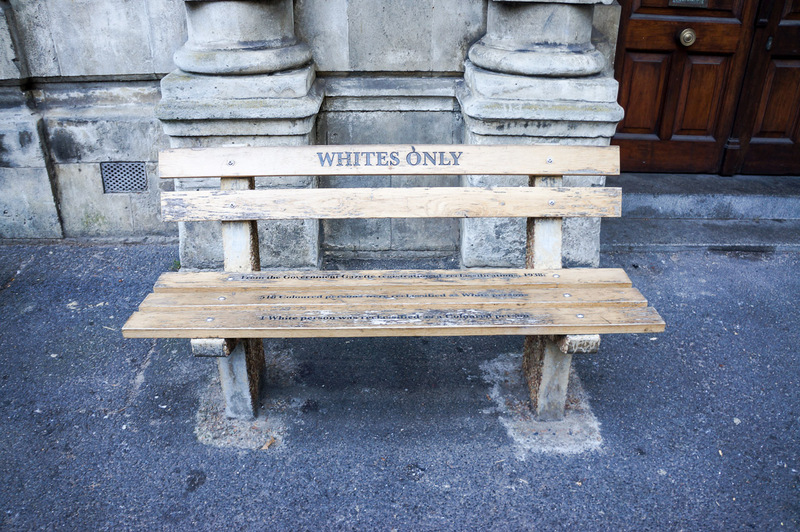 Bree Street – Bree Street is Cape Towns “coolest” restaurant strip. A very trendy street with lots of funky restaurants and quirky shops. The street has a good mix of hospitality and retail. The options on all of these streets really are endless. If you know you’re heading to CT and have a special occasion, call in advance and make a booking for The Test Kitchen at The Old Biscuit Mill. 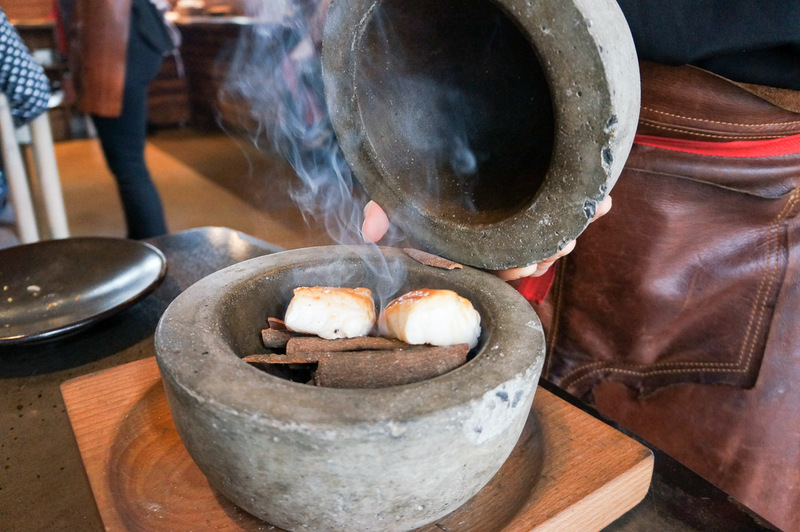 This restaurant was rated #28 out of 50 in the world. 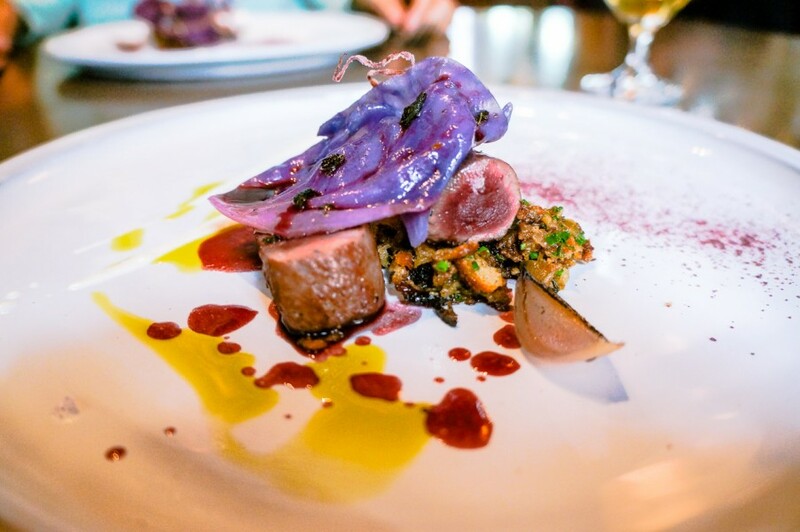 5 courses for USD $41 with an option to include a wine pairing. It was absolutely delicious and a real treat to finish off our time in Cape Town. 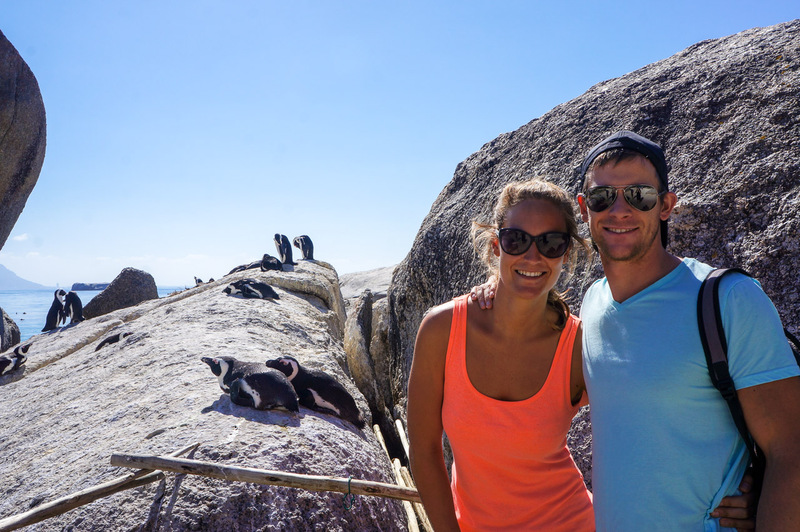 Muizenberg, Boulders Beach, Cape of Good Hope, Chapman’s Peak & Hout Bay were all visited in one day (in that order). It was one of our favourite drive days and very do-able in one day. 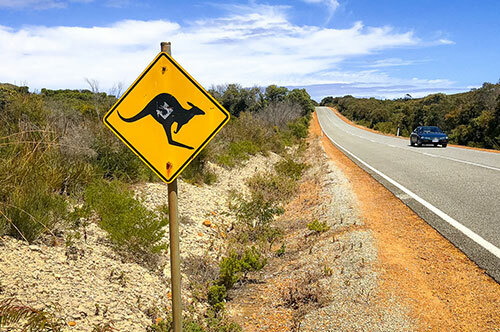 Don’t get sucked into the arranged tours, renting a car is much more affordable and enjoyable. 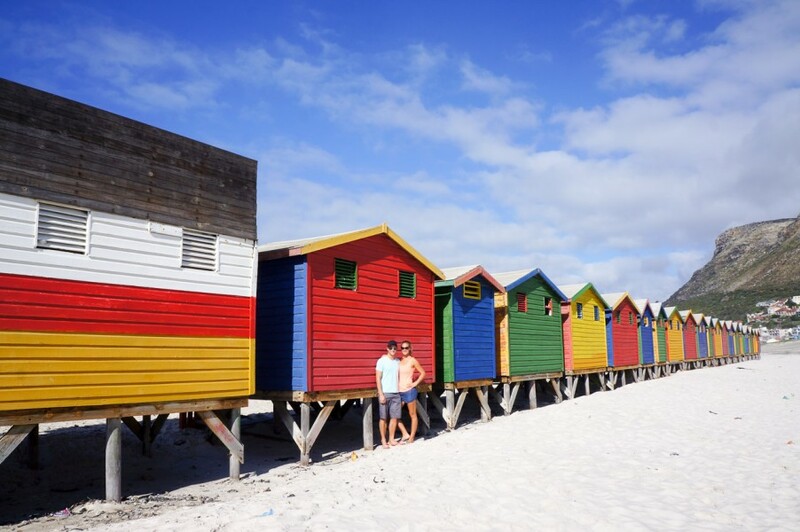 A quick stop to the seaside town with brightly coloured houses along the beachfront. We had all sorts of fun taking photos with these houses. 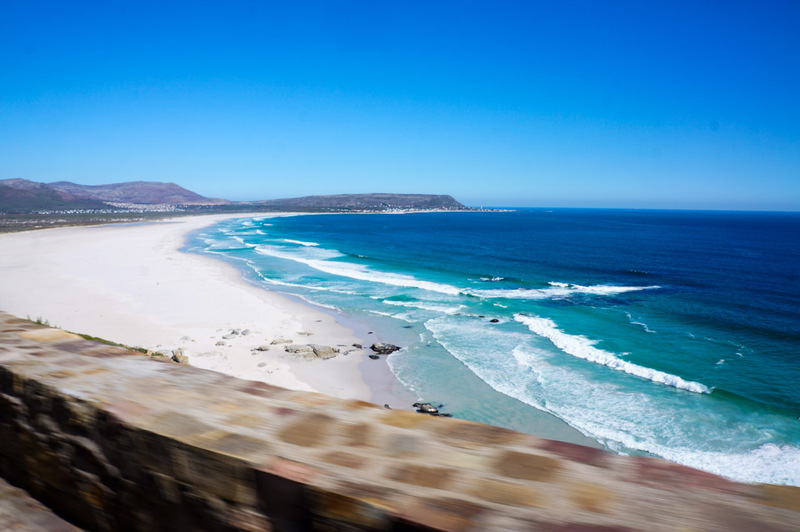 Muizenberg beach is also a popular place for beginner surfers. 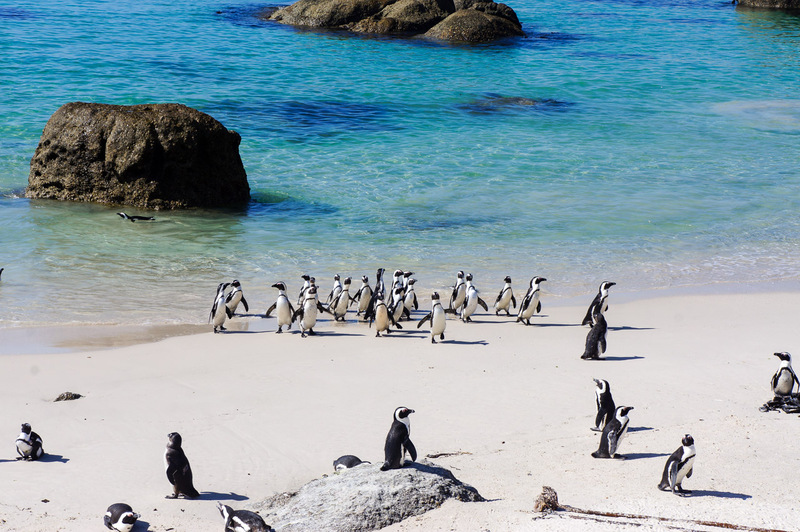 Nestled between Simon’s Town and Cape Point, Boulders beach is highly visited due to its safe clear waters and of course, the African penguins. 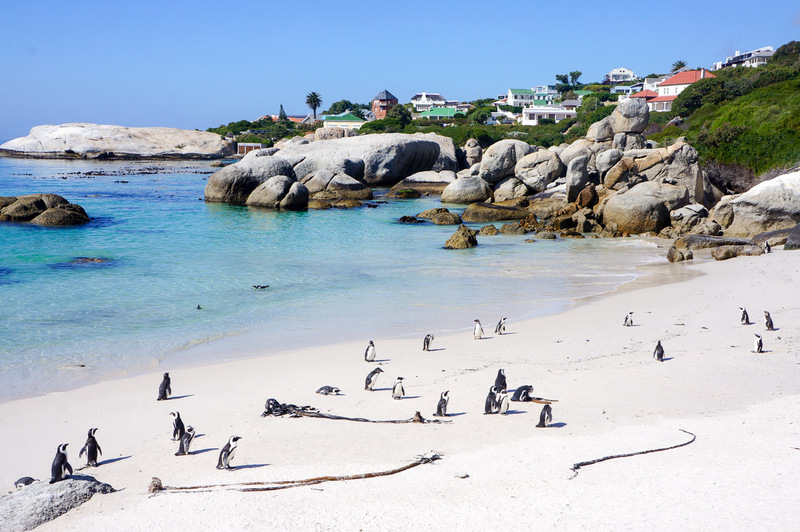 Boulders beach is accessible to swim and view the penguins however the majority of the penguins are found at Foxy’s beach, a short walk along the Willis Walk boardwalk. You can get really close to them from the viewing point here. Be prepared to block your noses at times, it can be quite smelly. 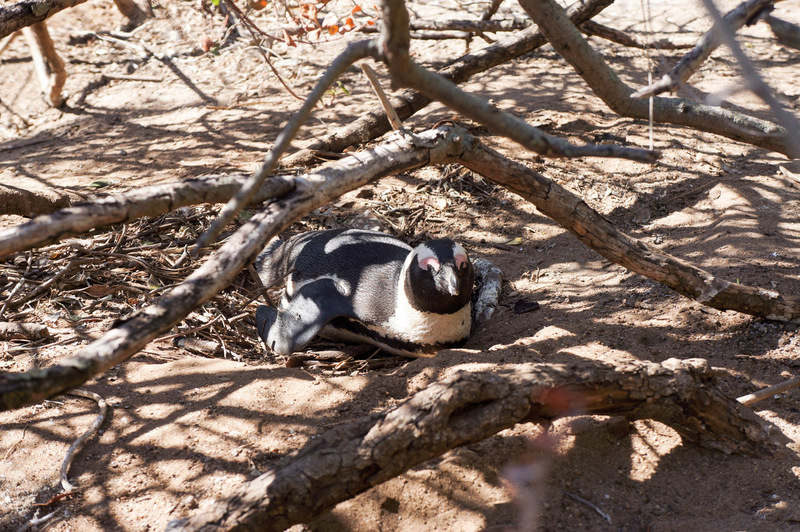 Entrance is 60 ZAR and will grant access to both sides of the park. The access to the beach is quite hidden but it is there. The Cape of Good Hope is the southernmost part of Africa. Tourists flock here by the busload every day to walk to the lighthouse located on the top of the cliff. A funicular is available but the walk is easy. 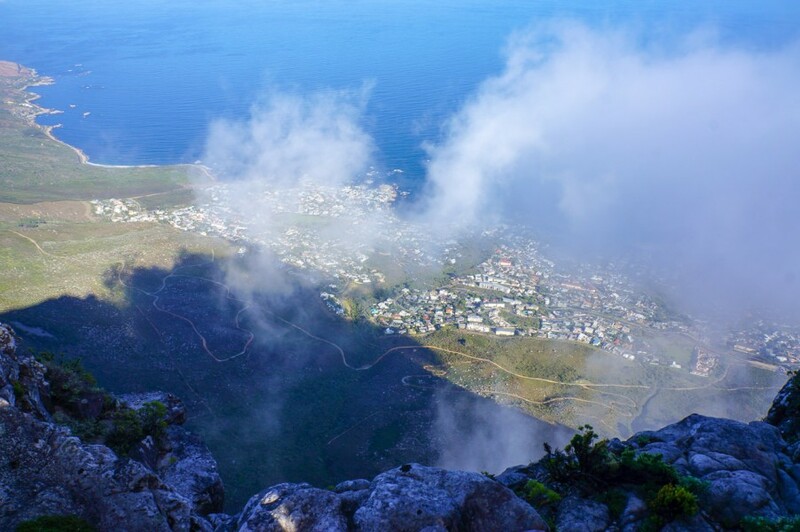 The views, of course, are magnificent, a real treat to the eyes and you feel on top of the world. 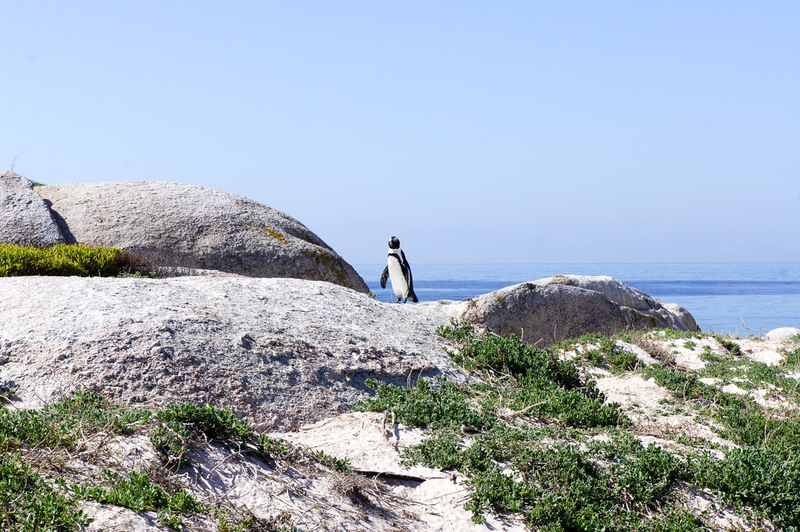 The nature reserve is large so be sure to allow at least an hour to walk around, photograph and enjoy the views. 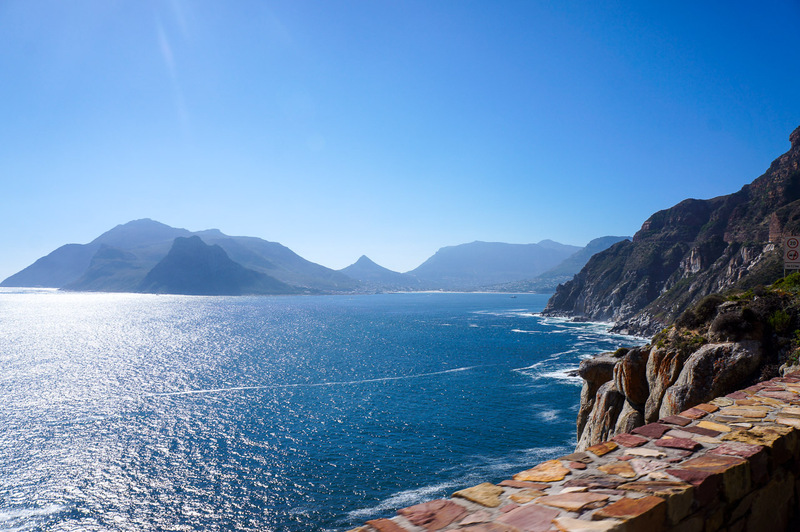 Chapman’s Peak Drive on the Atlantic Coast runs between Hout Bay and Noordhoek in the Cape Peninsula. 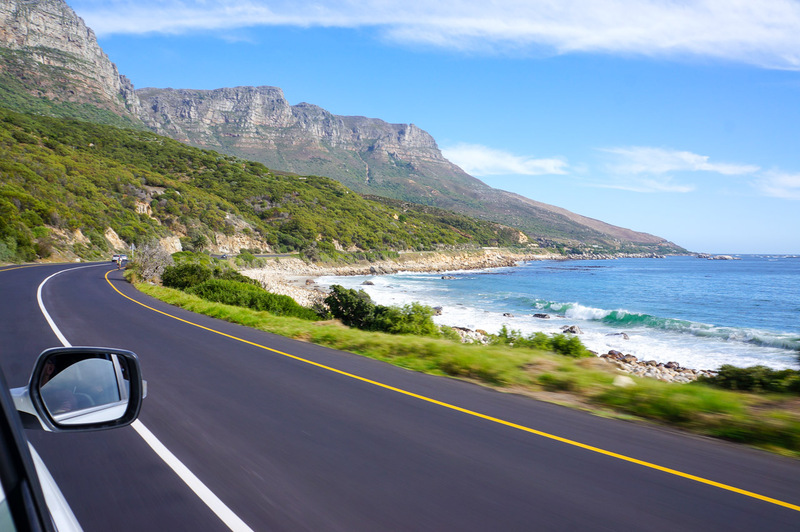 This drive has to be one of the most scenic breathtaking drives we’ve taken. 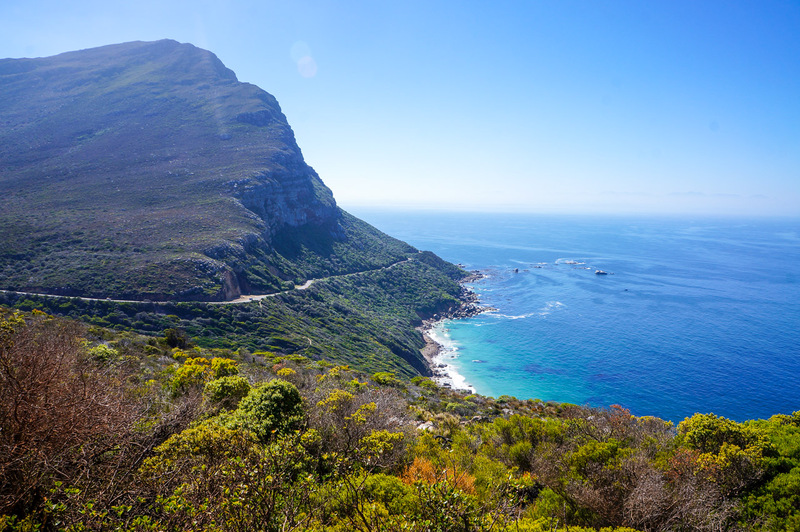 You can’t (& shouldn’t) miss this road when doing the drive from Cape Point. Make sure to stop and take some pictures along the way. 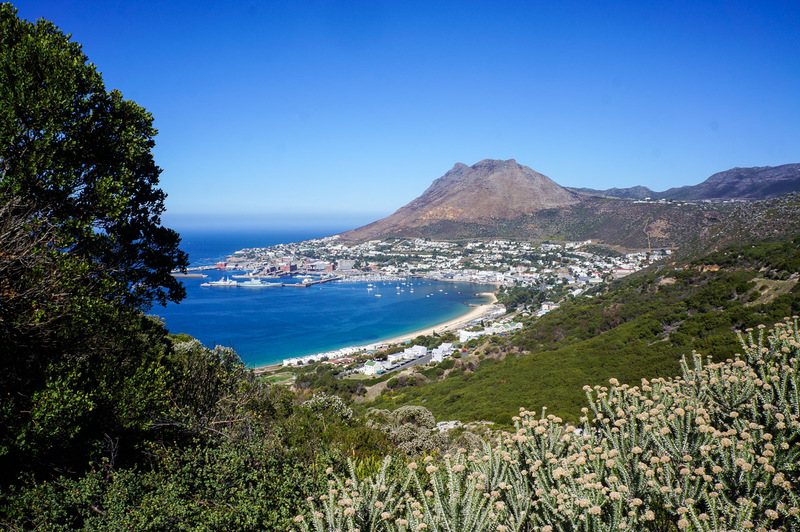 After driving along Chapman’s Peak Drive, a stop in Hout Bay for lunch should be next on the cards, especially for all seafood lovers! 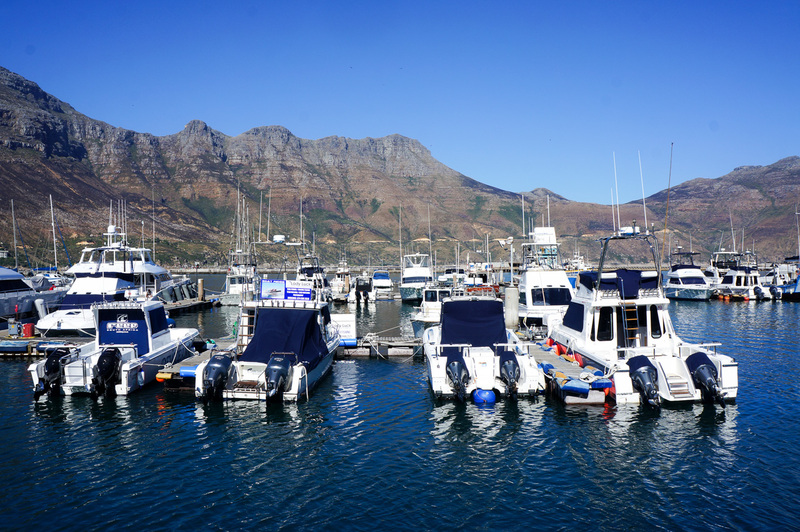 Hout Bay is iconic for fresh seafood and is one of the most active fishing harbours in South Africa. We had lunch at the Look Out Deck and whilst eating, we watched the seals play right in front of the restaurant. 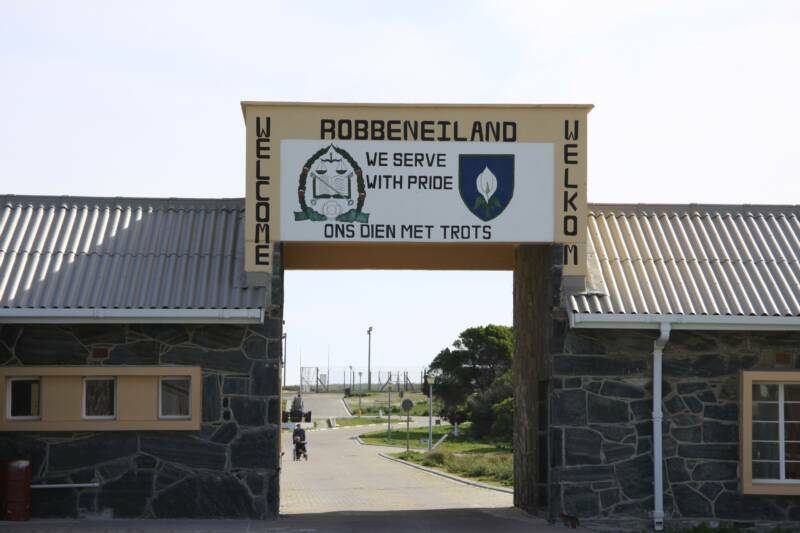 Robben Island is where former president Nelson Mandela was held in prison for 18 years of his sentence. 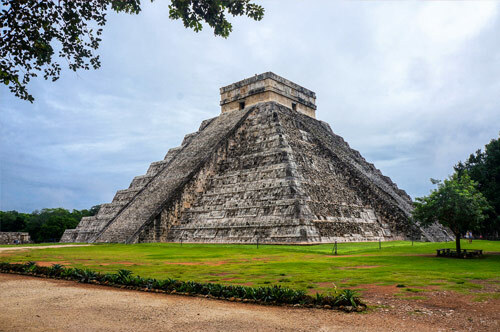 Although this prison was once intended to crush the human spirit, it has turned into the complete opposite and is now visited by people from all over the world. 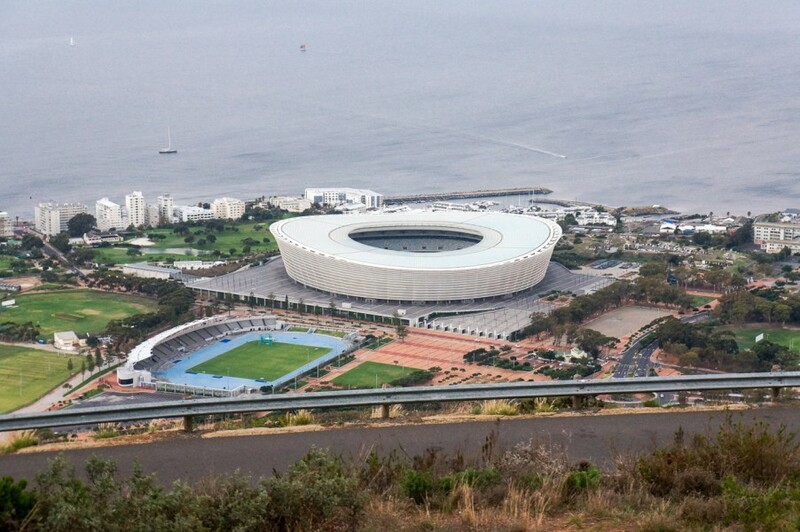 Tours (3.5 hours) are available from the Victoria Alfred Waterfront for 300 ZAR. Online reservations are recommended. Without a tour, you cannot access the island alone. Be vary of the weather conditions, winds and rains will see the tour cancelled. 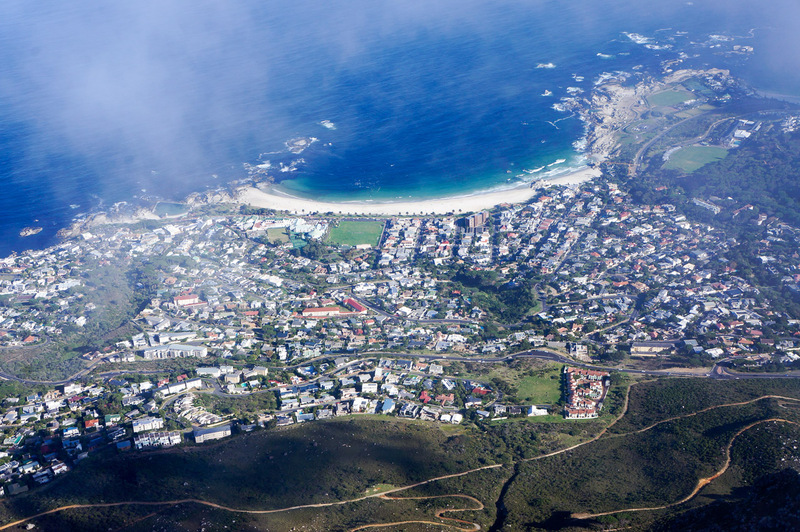 This area is noticeably more expensive than Cape Town and it shows in the real estate more than anything. We were fortunate enough to have great weather during our stay so we spent some time on the beach. Along the beach, you have endless choices of cafes and restaurants. If you feel like splurging, The Codfather is an awesome restaurant to grab a seafood lunch. 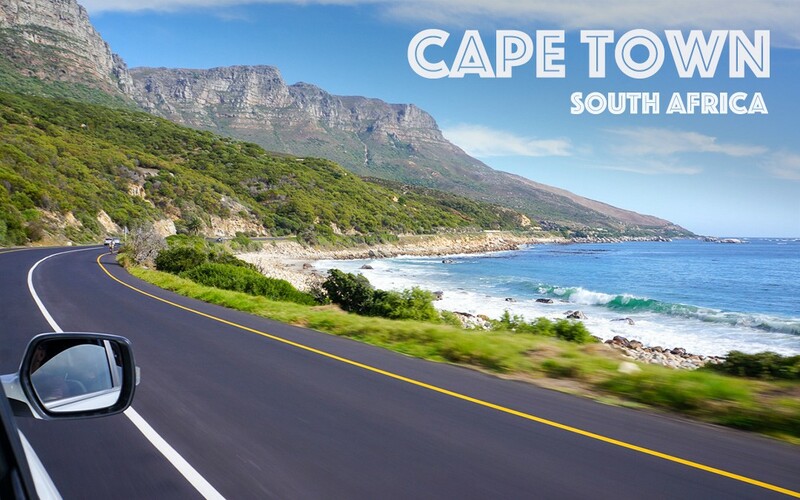 Whilst on the topic of driving, be sure to check out the detailed itinerary of our Garden Route road trip. 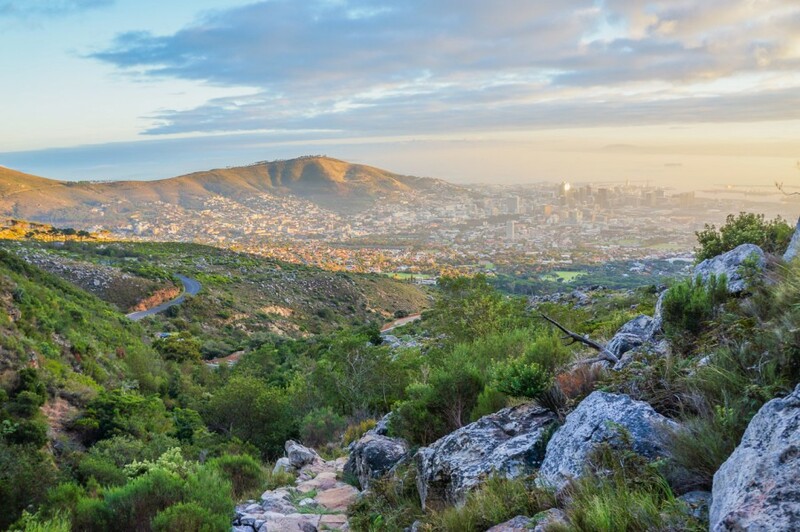 No trip to South Africa is complete without this journey. Believe us! 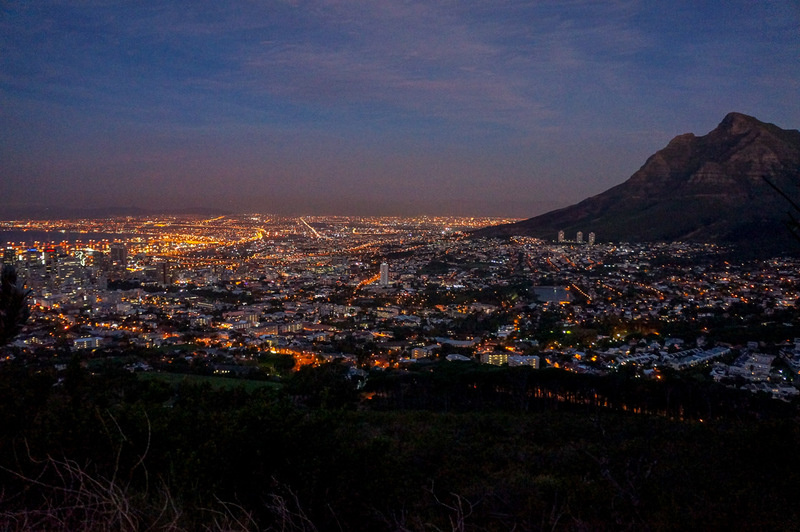 As you can see, we fit quite a lot into our time in Cape Town, but to be honest, it never felt rushed. Everything is relatively close and very accessible via rental car or uber (20% cheaper than regular taxis). Certain cities make a lasting impression and this was definitely one of them. 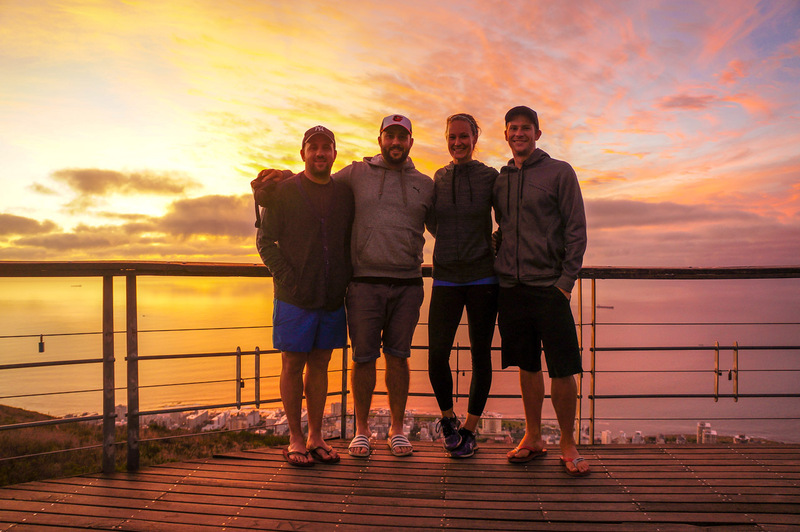 Till next time Cape Town! I love that, this is now on top of my check list! It should be! 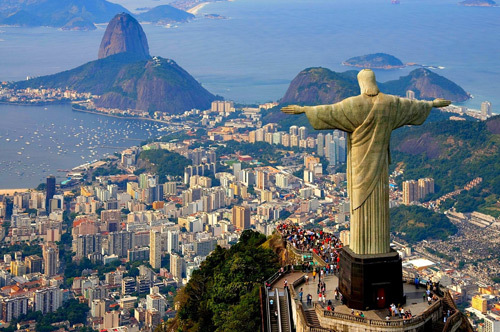 It’s one of our favourite cities in the world.